Jeff Petry and Jonathan Drouin each scored and added an assist as the Montreal Canadiens edged the Calgary Flames 3-2 on Tuesday night for their fourth win in their last five games. 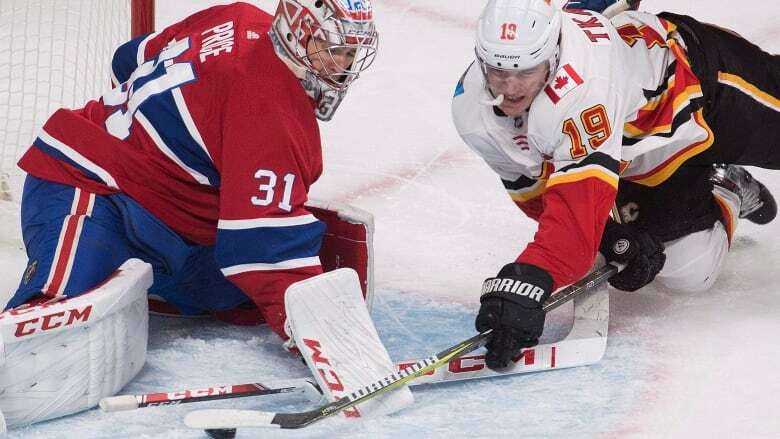 Flames goalie David Rittich did everything he could to keep Calgary in the game for the second straight outing, but he fell just short against the Montreal Canadiens. After a 44-save performance against the Rangers his last time out, Rittich made 37 saves as the Flames dropped a 3-2 contest to the Canadiens on Tuesday night. The Czech goalie was by far Calgary's best player, keeping the score close while his teammates failed to generate enough offence. "He's not God out there," said Matthew Tkachuk of his goalie. "He can't stop everything. At one point they're just going to go in. They keep getting these chances. Eventually it's going to go in. "It was a bad effort after we got away with one in New York because of our goalie. And maybe tonight we can return him the favour and play well and bail him out, but the opposite again." Rittich was locked in to start the night. The undrafted 26-year-old made big saves on Canadiens forwards Jonathan Drouin and Max Domi early in the first period to set the tone for the encounter. He made a breakaway glove save on Artturi Lehkonen look easy. The Flames jumped to a 1-0 lead at 16:46 of the first period when Tkachuk's shot bounced off Michael Frolik's skate past Carey Price. That set the stage for Rittich's highlight-reel saves in the second period. With Calgary still holding onto the lead, Rittich made four saves on four different Canadiens players in a two-second span. First came Xavier Ouellet's shot from the point, followed by three quick rebounds by Phillip Danault, Victor Mete and Brendan Gallagher on the doorstep. "Right from the start you could see how sharp he was again," said Flames captain Mark Giordano. "Tough not to get points tonight when your goalie's that good and holding you in it for as long as he did. Montreal (5-1-2) was relentless in the second period, aided by four consecutive penalties against Calgary (5-4-0), as the home team scored three times in a 3:21 span en route to its fourth win in its last five games. With TJ Brodie in the box for interference, Rittich finally met his match when Jeff Petry fired a one-timer from the faceoff dot at 15:50. The point was Petry's 100th in a Canadiens uniform. Again playing with the man advantage, the Canadiens made it 2-1 after Gallagher redirected Petry's sharp pass behind Rittich at 17:29. With 49 seconds left in the second, Drouin found some daylight between Rittich's arm and his post as the winger extended his point streak to five games. Added Petry of Rittich: "We knew that eventually he was going to break and we needed to continue to get pucks to the net and the result was going to come." Elias Lindholm got one back for the Flames at 11:10 of the third as he finished off a give-and-go with Mikael Backlund for his team-leading sixth goal of the year. Price made 21 saves to tie Patrick Roy for second in team history for most wins by a goaltender with 289.